Take on the Giro D'Spin! Steam your way up the side of Mount Etna. Blast through the forests of southern Italy. Feel the wind on your face through the coastal towns. All while on a static bike in the fitness and dance studio (some imagination required). 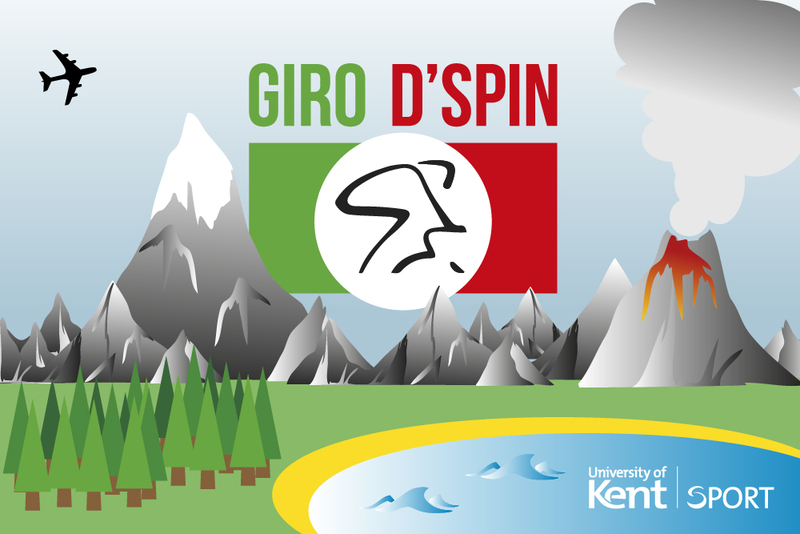 From the 8 to 28 May, you can follow the iconic Giro D’Italia cycle race, now in its 100th year, with Kent Sport’s own version, the Giro D’Spin. Take on 18 challenging strength, endurance and intervals stages as you trek across Italy, France, Switzerland, Sardinia and Sicily before the final event in Milan. Italian/cycling stage prizes are up for grabs at the end of each class, with each class you attend getting you one ticket in the grand prize draw on the 28 May. The first class began with the Sardinian stage on Monday 8 May, with a triple entry ticket for the grand prize on offer for all riders and a bottle of Limoncello for the winner. Check out the stage map and class list for more details. Or see the fitness and dance page for this terms timetable. Be sure to book a spot in the class using the online booking system or at the Sports Centre or Pavilion receptions. To stay up to date with Kent Sport news, events and special offers, Like us on Facebook and follow us on Twitter UniKentSports.